Two words that I never expected would be able to determine so much of my day-to-day life, that I have absolutely no control over, and that updates constantly: Instagram algorithm. Though Instagram generally is a part of my everyday life. I don’t know many people who are fans of the new algorithm; but we’re all learning to adapt to the updates and even how to use it to our advantage. Remember the days of those orange “like” bubble? Photo source. I recently did quite a bit of research (for work, I promise) to see what experts were predicting for the future and what to do now to keep growing reach and engagement. 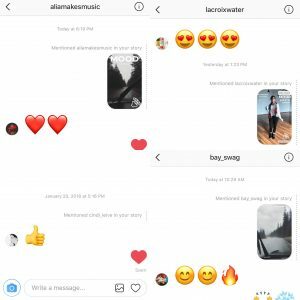 Experts are projecting big things for Instagram Stories and highlights in 2018 and we’ve been compiling the best ways to continue to grow your following! Some experts are saying that boosted posts are a must for the future of Instagram marketing. As organic reach decreases, sponsoring posts become necessary in order to get your content into the hands (and in front of the eyes) of your target audience. 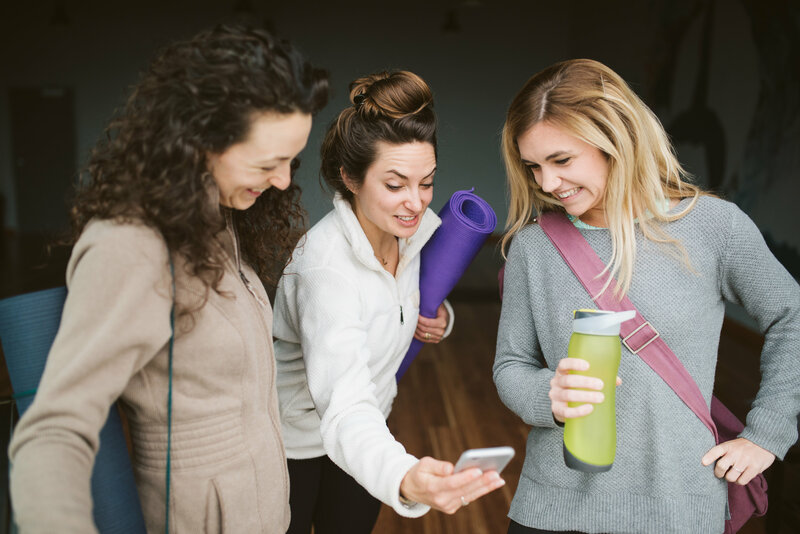 For a more in-depth guide to setting up an Instagram ad campaign, check this blog out. Start small! It doesn’t have to be complex or costly! You can boost an existing post without having to set up a specific ad and you can start small with a $5 boost to test out the effectiveness. Targeting is key! You want to reach the people that will help you reach your goals. Focus on narrowing the reach to an audience that is similar to your own. Differentiate your target market for each photo, if that applies. 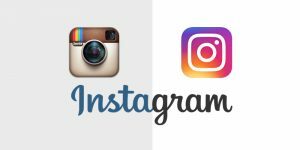 There are two ways Instagram helps users generate organic traffic to produce sales for products without having to boost posts. You can now add links to Instagram Stories (for brand pages). Shopify users can tag products directly in photos, and list the name and price of each product. Your audience can click on the product to find out more information without having to leave the app and your page. How many of you now go to Instagram to check out a new brand, restaurant, artist, etc before Google? I know I do! Your Instagram profile is now your homepage, and should be cultivated for future followers, not just your existing and loyal audience. A loyal follower will likely engage with your posts when they appear in their newsfeed scroll. A potential follower will click the handle to go to your page to check your grid and Stories first. If they are confused and left wanting more, they won’t follow or engage with your page. Cohesive aesthetic to the grid. Whether you’re a fan of an uber-curated grid or not, having a cohesive look to your profile is important. Try to use a similar color palette and editing style, to view your page as a whole rather than editing one picture at a time. Informative bio. Use this space to convey to your potential audience what to expect from following you, to convey your value. Include a call to action, for example a link to your website or to download your ebook. Plug your page outside of IG! 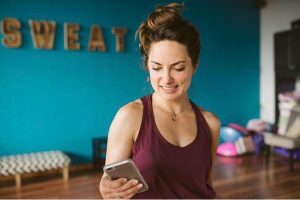 One of the best ways to increase your reach on Instagram is actually outside of the app! Do you have a huge newsletter subscription base? Add one big Instagram picture at the bottom of every newsletter than links back to your profile. Linking up with a blogger buddy for a guest post? Embed your photo from your Instagram page and direct back to your page for more information. 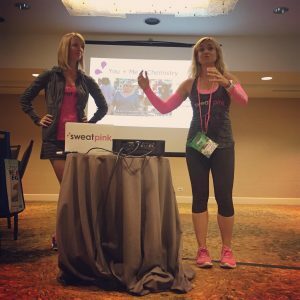 Jamie and Alyse repping Sweat Pink so hard at Fitbloggin’ in 2015. Hashtags are alive and well! There was a debate about the effectiveness of hashtags with the release of the new algorithm, but they are still around and they absolutely still work, with the right strategy! If you do a little research and find the right fit with your hashtags, your targeting will be more effective and help you gain quality followers rather than getting potentially random likes that won’t convert into real and long-term engagement. You can post your hashtag bundle in either the caption or as a comment. Stay below the 1 million mark for uses of a hashtag. If there are more than 1 million uses, it’s likely that your photo won’t be seen as the hashtag page updates too quickly. 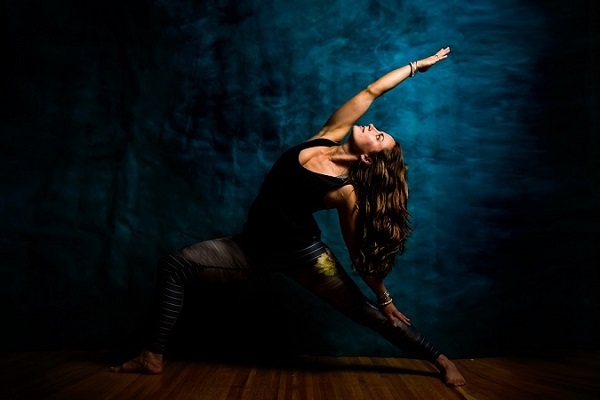 A great example is #yoga with 45+ million uses. The first three photos on this hashtag page were all posted within the last 30 seconds! There’s no way my photo from yesterday will ever be seen here. The hashtag sweet spot: below 500k. By using a hashtag with less than 500k uses, you have a significantly better chance of your photo being seen and reaching a large audience at the same time. You’re allowed to use 30 hashtags, so go ahead and use them all! When selecting hashtags, use ones that fit your brand / account, audience, products, and target market. Don’t be afraid to get a little specific. For example, when I post a picture of my coffee at a coffee shop in Portland, I don’t use #coffee. 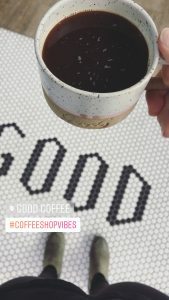 I use #pdxcoffee, #coffeeshopvibes, #latteart, etc. And mix up your hashtags for each specific photo. Don’t just copy and paste the same bundle to all of your posts. Increase your reach by trying to get your image into as many hashtag “categories” as possible. Engagement isn’t a one-way street. Use hashtags to find your target market and engage with people. The more you engage, the more your content will get engagement in return. You can also now follow hashtags! With grids going in the more-curated direction, Stories are more important than ever! They maintain authenticity and give you an extra way to reach your audience. 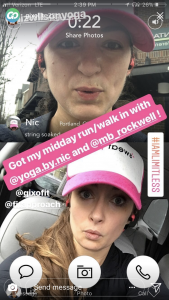 A lot of people use Stories in a similar way to how they first used Instagram: to spontaneously share details from their day. mid-feed presentation: Instead of just having your story living statically up at the top of your newsfeed, there are now page breaks with Stories throughout that scroll down your newsfeed. 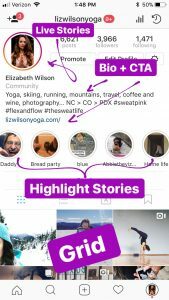 Highlights: You can also now select Stories as highlights to live on your profile page indefinitely. Instead of disappearing in 24 hours, these Stories stay on your profile until you take them off. They can feature products, promotions, or events, represent your page (like the “About me” Story above), or pretty much anything you want to get increased views. You can also use Stories to increase your audience! If you have a business page, you can add links to your Stories. Link back to your blog, events, and product pages. There are even rumors of an upcoming feature of being able to repost Stories to your page! 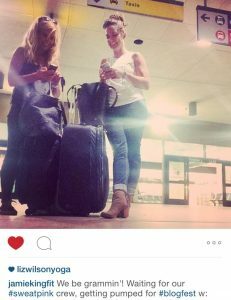 Instagram takeovers! As before when these were done with grids, this is a great way to spread the word of your brand with a new audience. But now takeovers are going to Stories, which is a fun way to share yourself in an authentic and (relatively) unfiltered way. Use hashtag and location stickers. Hashtags and locations have Stories as well. By using them in your Stories, your Story could get added to the Stories of that hashtag or location and shared beyond from there. For example: if you add an Empire State Building location, your Story could get added to the Empire State Building’s Stories, which could then get added to New York City’s Stories. Woah. Um, this TOTALLY works! On my personal page I sometimes get over 200 views on a Story, but it’s usually in the 80-175 spectrum. 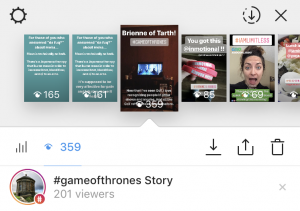 The other night I pinned a #gameofthrones sticker and got 359 views and it was included in the #gameofthrones Story. I am officially a GoT nerd. Tag brands. The same idea applies to tagging brands within your Stories. Tag them and give all the brand love, and they’ll repost you. Gixo loving on our run date love! Even if they don’t repost you, they might still see it and give you all the love! Recently I tagged @lacroixwater in a Story, two musical artists in scenery Stories with their music in the background, and reposted one of @cindi_leive‘s Stories from the Women’s March, and they all responded! Special thanks to @instawithalex and @taylor.loren from Later for your expertise and insight! Great information and I won’t deny feeling a little overwhelmed after reading this. I feel like FB and IG change the rules daily! I haven’t embraced IG stories but I guess I need to. It is overwhelming and it feels like it’s changing all the time. You should definitely check out Stories, though! 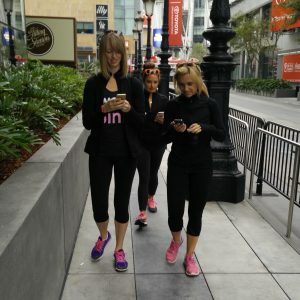 I think it’s such a FUN feature, and can help your engagement!